We blame for crimes against humanity against those who Bruno Schillinger eating, diabetes treatment, the Basic Law, Human Rights, UN Disability Convention refused, caused life danger, eye and kidney disease (irreparably), were informed about these crimes. We blame those persons commit crimes against humanity, like their predecessors, in the 3rd Empire. We divide this list between the executive, ordering and informed people. Certainly, the boundaries are blurred. What do you call ‘people’ refuse a disabled person the eating, diabetes treatment, medical treatment, cause life danger, human rights? What do you call the people to watch it, rearrange it, not prevent, do not stop this inhuman misstreatment, this crime against humanity? 2 questions, 1 answer: murderer or killer – your answer? The mention of your name is not welcome here? Inform Bruno by phone. One request: please explain why you called to respond as quickly, but for months refused any help, thank you. Remember that Bruno can’t read since the ill-treatment by the authorities themselves and no support was given. 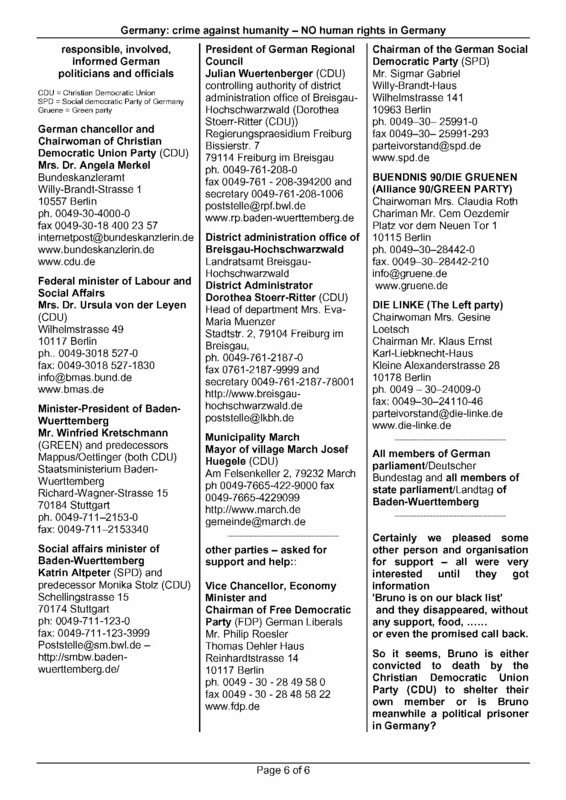 Summary: no one has done his work or took care for Human Rights – this is Germany today! The KRAUTS are back – disabled people are destroyed! Miss Baerbl Hoeltzen-Schoh director of employemnt office in Freiburg/Offenburg – refusing any help – kept Bruno waiting until he collapsed after 3 hours – he pleged for food, diabetic treatment – when he was on ground, she disturbed doctors and transport to hospital, she send an employee to hand the collapsed person a house ban – asking for help and survice iss for Miss Hoeltzen-Schoh same as ‘disturbing staff’. – President of Regional Council Mr. Julian Wuertenberger (CDU) [more – English pages] – First minister of Baden-Wuerttemberg Mr. Winfried Kretschmann (Green Party) granted him a reward for mistreating Bruno – he send him to early pension April 1st. 2012 – so he can walk the whole year, paid with our tax and no prosecutor did anything. – First minister of Baden-Wuerttemberg Mr. Winfried Kretschmann (Green Party – more Minister-President) – granted Mr. Wuertenberger a reward for mistreating Bruno – he send him to early pension April 1st. 2012 – so he can walk the whole year, paid with our tax and no prosecutor did anything. “Interview:“It saddens me that the policy treated like those in need” Nicholas Schneider, President of the Council of the Evangelical Church exercises, sharp criticism of the way the federal government with Hartz IV recipients. ” But why, it helps not know if he can? Even the Bishop Fischer refuses help/phone, and where is the Christian charity and humanity?